Morocco is an acreage of spices, known for its dazzling colors and sweet-smelling fragrance. It is also known for its traditional beauty secrets. The Moroccan black soap is a thick golden brown paste with a green highlight. Black Soap is part of pacifying skin treatment. This magnificent product is rich in minerals that help cleanse the skin, hence leaving an incredibly charming and smooth finish. 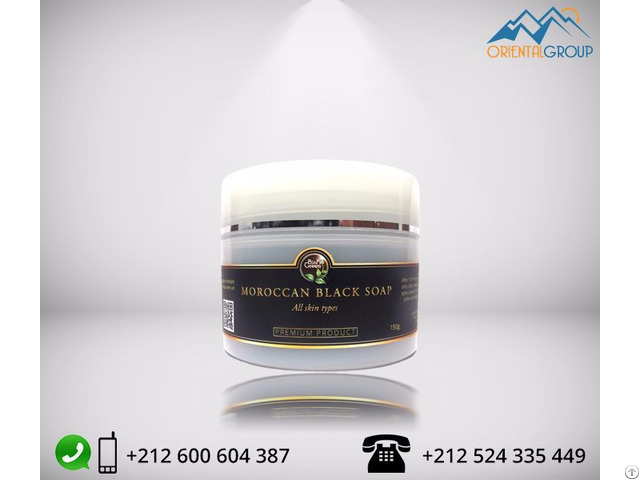 For centuries, Moroccans have black soap which is the secret to clean, healthy and glowing skin. Beldi soap as its often called is a 100% natural plant product. The dough is based on an olive oil, pulp, which is enormously rich in vitamin E and an excellent exfoliator and moisturizer. It purifies the skin by eliminating dead cells and toxins, leaving the skin soft and silky to the touch. Consequently, it has a texture of butter and high content of vitamin E, which helps refresh the skin, working against dryness, aging, and dehydration of the skin. The lather of the soap is modest, and you will love its rich texture. Moroccan black soap is suitable for all skin types, especially for dry and mature skin. The Soap is part of a traditional hammam ritual. This is the first treatment in an oriental public bath. If you ever visit Morocco, then it's essential to your tourist experience to enjoy a hammam. The soap is produced from a mixture of oil and wrinkled olives, soaked in salt and potash. Over the years, this black soap used as a product for dermatology, and later became a real beauty tool for body, appropriate for all skin types. Moroccan black soap is filled with Argan oil or olive oil and infused black olives, as a result, it organizes the skin for exfoliation. With this, the skin will be softer and ready to scrub. Combined with the action of Kessa gloves, removes impurities and dead skin cells. As a result of its exfoliating and moisturizing, it softens and at the same time sustains the skin. It hardly foams, but becomes creamy when water is added. Moroccan black soap is also enriched with eucalyptus oil, which gives the skin a youthful radiance. Therefore, your skin will be left with silky and soft feeling for days as a result of an efficient hammam experience. The most attractive quality is that it is appropriate for all skin types. The Components also offer therapeutic value. The soap deep cleans the skin by removing toxins and dead skin cells (the rough and dry outer surface) making the skin softer. The exfoliation increases circulation of blood and lymph. With its anti-microbial properties, Moroccan black soap is rich in vitamin E which highly relieve itching due to excess of dead skin and blocked pores. It is also ideal for in-growing hair reduction. Once this is done, your skin is ready to absorb better treatment from the next skin care treatment such as mask, tanning and moisturizing.